Alter Terra has been actively and successfully developing partnerships with relevant agencies that regulate enforce and/or promote pollution prevention practices since its inception in 2008. The staff, officers and board of advisors have agreed on approaching government agencies with recommendations, educated opinions, advice and proposals to encourage interventions in the United States and México border area. The following is a short list of work performed in close coordination with Federal, State, and Local authorities in both countries. In December of 2013 Alter Terra approached California State Senator Ben Hueso to request support for the Tijuana River Valley Recovery Team. Alter Terra co-directors Oscar Romo and Jennifer Hazard were selected by Sen. Hueso to draft language for a Senate Concurrent Resolution in support of Tijuana River Valley Recovery efforts; specifically for the management of transboundary flows of trash and sediment that pollute the Tijuana River Valley Estuary in San Diego County, California. In June of 2014 SCR 90 – the Recovery Team Resolution passed the senate with a final vote of 32-0. This legislation will be used as an antecedent to create future legislation and financial support of recovery efforts throughout the binational Tijuana River Valley. At the inception of this Federal Agency in 1994, Oscar Romo was appointed by Mexican President Ernesto Zedillo as a member of the National Council for Sustainable Development and was re-appointed to serve for three administrations totaling 18 years. Romo participated in multiple international negotiations representing the Mexican government including the US/Mexico environmental program and the affairs related to the side agreements of NAFTA between US, Canada and Mexico. This affiliation has been essential in maintaining a healthy relationship between SEMARNAT and Alter Terra. SEMARNAT has funded Alter Terra to manage three consecutive Temporarily Employment Programs in 2010, 2011 and 2012, and to provide training, advice and support to other NGO’s in managing their own projects. These programs that employed more than one thousand people were design to abate pollution, re-valorize trash and to train residents in the incorporation of best management practices throughout communities located in Tijuana’s coastal canyons. As a result, trash removal efforts, re-forestation and restoration, environmental infrastructure, sediment control and water harvesting projects have been accomplished, and residents have learned how to apply environmentally friendly technics when expanding their homes or working on community projects. Alter Terra has been influential in the development of the State Environmental Program 2008-2013, in the modernization of state-wide environmental legislation and in the introduction of innovative ideas to the SPA strategic plan 2012-2016. In addition, Alter Terra has contributed by training the staff of the state nursery in the propagation of native and drought resistant shrubs and trees, which in time were utilized on a large scale re-forestation program in los laurels canyon planting 3500 of these trees. In an ongoing effort, Alter Terra and River Partners, a nonprofit based in Chico California, has proposed a bi-national effort to restore the Tecate River on both sides of the border; this project is already part of the SPA strategic plan and prioritized as a fundable project by the State of Baja California. SPA, following instructions from the State Governor Guadalupe Osuna, became the first public agency to place an order to purchase pervious pavers from the cooperative sponsored by Alter Terra, the product was delivered to a community park on a ceremony attended by the Secretary of environmental protection, other dignitaries and all the project participants. Alter Terra has worked directly with this municipal agency in the development of pollution prevention practices for small business, soil conservation codes for developers and re-forestation programs implemented by the city of Tijuana. In 2011, Alter Terra donated 2,500 one gallon native plants and 200 pounds of coastal scrub sage seeds to establish the first municipal native plant nursery. Alter Terra also serves in the capacity of advisor to the director of the agency. Alter Terra was invited to work with this agency after demonstrating through a series of presentations and recommendations the importance of addressing the environmental challenges faced by disadvantage communities as a viable way to improve social conditions in Mexico. Since then, Alter Terra has been awarded 2011 and 2012 grants to conduct intensive training to organize local residents in the establishment of a cooperative to manufacture and commercialize environmentally friendly and socially responsible products to abate pollution, control erosion and to harvest water; in doing so, Alter Terra’s staff has developed a syllabus, a comprehensive illustrated manuals, and training methodologies to instruct participants on the process to create their own business, to secure funds, and manage their finances, taxes, payroll, reports and purchases, also to effectible commercialize their products. At the present time Alter Terra’s staff is working on another stage of the program which includes the installation of an industrial type of infrastructure to operate a machine also funded by SEDESOL to manufacture pervious concrete pavers. On another ongoing SEDESOL-Alter Terra project, our staff is coordinating a group of 150 families to help improve their dwellings by providing technical and economic assistance to incorporate environmentally friendly and pollution reducing practices. The final implementation process, which will occur this winter, will produce improvements throughout Los Laureles canyon. Alter Terra was awarded grants in 2011 and 2012 to promote the use of best management practices and to incorporate climate adaptation technics. The grant was used to train residents in the understanding of climate change, to assess vulnerability and to incorporate BMP’s in the design and construction of permanent structures. These projects were completed in December 2012. In another joint effort, Alter Terra staff worked closely with this agency in development of conceptual ideas to identify opportunities to build “pocket parks” to alleviate social and environmental conditions in troubled and neglected neighborhoods. This municipal agency awarded Alter Terra grants in 2011 and 2012 to augment other donations to maintain an after school program for K-12 children. For the seventh year, this popular program allows school-aged children to spend a few hours per week learning about species conservation, natural resources, trash re-valorization and environmental health while building objects with their own hands. Staff members from the Ibero-American University and Alter Terra partnered to serve as educators, deliver all the necessary tools and materials, and provide lunch to a group of abbot 50 kids. Alter Tierra’s staff has also been invited to coach other program sponsors throughout Tijuana and to help in the development, review and evaluation of projects by sharing it’s expertise with smaller or less organized NGO’s. In order to fully understand the dynamic situation at one of the hot spots within the Tijuana River Watershed impacting the Tijuana River Estuary and following a previous attempt done in 1999, Romo proposed a project to the California Coastal Conservancy (CCC), to redefine the role of traditional urban planning in coastal canyons, into watershed based planning to prevent the degradation of the land, to conserve natural resources and to improve the resiliency of the coastal ecosystems. The $250,000 grant request was approved in 2003 and was used to generate baseline information for los Laureles Canyon on hydrology, topography, geology, biological resources, soils, human settlements, urban infrastructure, environmental infrastructure, vulnerability, and other parameters. To gain the support of Mexican authorities, the Mexican Institute for Water Technology (IMTA) and IMPLAN were identified as partners to create a comprehensive diagnostic of the canyon. Work began in the fall of 2003 with the participation of 16 scientists from IMTA and 2 urban planners from IMPLAN under the direction of Romo; the team worked for about 16 months and produced more than 70 layers of GIS maps, about 750 pages of baseline information and the compilation of public opinions from over 70 community meetings. Alter Terra has worked with this state agency in arranging the introduction of water and waste water infrastructure to neighborhoods in los Laureles canyon. The project promoted by Alter Terra resulted in the construction of 2 potable water cisterns, 1 pumping station, sewer lines and the installation of drinking water intakes and sewer connection to the 800 lots. 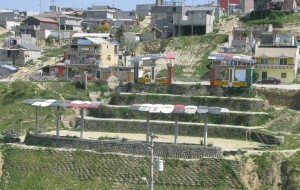 The project began in the spring of 2009 and was completed in the fall of 2011, since then other major improvements in los laurels canyon have been implemented, such as, the re-habilitation of the lower canyon sewer pumping station and the introduction of additional communal water intakes for irregular neighborhoods. Water intakes for irrigation were also installed on the Border 2012 Park, built and maintained by Alter Terra. A water culture program established between CESPT and Alter Terra promotes water conservation, re-use and renegade waste water alternatives when the infrastructure is not present. For five consecutive years Alter Terra has been able to maintain its presence on the radio waves with a weekly one hour long program aired trough 102.5 FM every Monday at 10:00 am. This has been a powerful window into the regional Tijuana/San Diego community to publically discuss relevant issues in the environmental and social realms and to educate decision makers and the public at large about the importance of regional integration to solve common problems like pollution prevention and control, gaps in environmental legislation, the need for a stronger environmental education program and other important topics. Regular interviews with public officials, scientists, professionals, individuals seeking office, members of NGO’s, and others from Tijuana and San Diego have maintained the interest of the well-educated audience and the public at large. We believe that having access to this tool has dramatically improved our chances to influence the decision making process as many times over the listeners have made us aware of policy changes implemented as a result of ideas expressed during our show. Oscar Romo joined the bi-national discussion on border environmental affairs when the US EPA and the Mexican Urban Development Secretariat agreed on the creation of the Integrated Border Environmental Plan (IBEP) in 1992. Romo was appointed to participate on the initial discussions and subsequent meetings to provide input on issues, projects and plans. As changes in the federal administrations occurred, new ideas were explored and the two countries agreed in creating a new program. In 2004 the Border 2012 Program was launched and Romo was appointed as Chair of the Water Group for the California-Baja California region, in this position he helped developing policies and agreements, in the identification of priority projects and provided the necessary input to adapt to emerging conditions such as reduced funding. 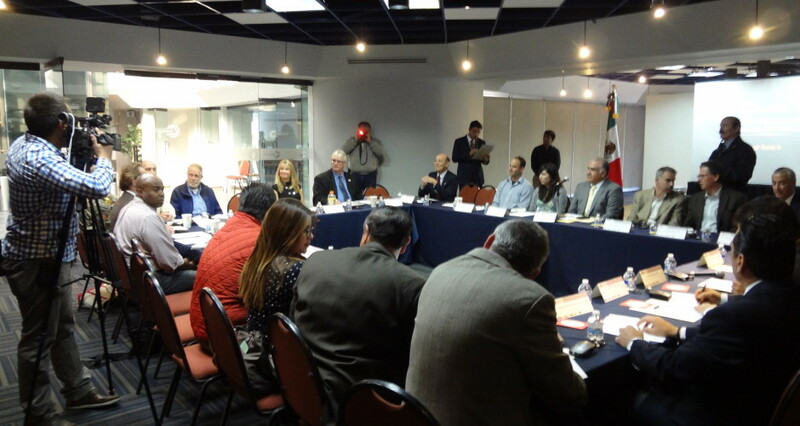 At the end of the cycle Romo participated in bi-national discussions to create the new US-Mexico Border 2020 Program and continues participating in the work groups. As an active participant of all the US-Mexico Environmental Border Programs since their inception, Romo has accumulated 31 years of experience in the context of environmental bi-national affairs, and has developed a large array of high level contacts in the border region and the two countries. In 2010 EPA through the Targeted Watershed Program, awarded a $1,000,000 dollar grant to promote a watershed management program and Romo was hired to head the Watershed Coordination Program. Romo was hired to head the NOAA Coastal Training Program for the TRNERR in August 2002 and served in that capacity for seven consecutive years. The program aimed to educate coastal decision makers in the United States on ways to conserve and protect coastal and marine ecosystems, but as program managers at NOAA headquarters did not immediately recognize the importance of including decision makers across the border, the peculiar location of the Tijuana River Estuary forced the expansion of its focus beyond the international boundary. During that time Romo and his team decided that in order to accomplish the hefty goals of the program, establishing a sister organization in Mexico could be a good strategy and an excellent way to gain credibility and cooperation of residents and decision makers in Mexico; that prompted the creation of a Mexican NGO as a compliment to the TRNERR and NOAA efforts. With the support of management from the two parent agencies Alter Terra was created as an extension of the Coastal Training Program. As part of this agreement, two initiatives were launched to further support endeavors in Mexico, the NOAA Pacific Coastal Storms Program, and the NOAA/City of Imperial Beach/SDRWQCP Trash Tracking Project. The science center was also created to further ensure the fulfillment of project goals; the center was equipped with all the necessary technology, equipment and tools and became the workplace for a team of researchers and academics. Alter Terra has been recognized numerous times for its ability to create innovative problem solving approaches to answer our region’s dilemmas; here are several examples of this, the Urban Land Institute www.uli.org awarded Alter Terra’s founder with Smart Growth Award for the “Los Laureles Master Plan” in 2008, the Visionary Award for its “Pervious Pavers Project” in 2009, and the Best of the Decade Project Award in 2010 for the design and construction of the “border 2012 Park” entirely built with trash collected within the Laureles Sub-basin and re-purposed as structural material. The Governor of Baja California also awarded Alter Terra for the Most Innovative Project in 2012, for the Pervious Pavers Community Project. SEDESOL, the Federal Social development Agency, for the Most Innovative Watershed Based Urban Plan and CONAGUA, the Mexican Federal Water Authority for the Creation and Implementation of Los Laures Watershed Council, Mexico’s smallest watershed council ever created. Alter Terra has been a Binational Collaboration and Innovation Award Finalist for the past two consecutive years at The Woodrow Wilson International Center for Scholars for our Trash Tracking and Community Mobilization Projects in Los laurels canyon. In both cases the project description has been published and distributed by the WWICS. We have been invited to participate again in 2013. Last year, the San Diego chapter of Coastkeeper delivered its Coastal Champion Award 2012 “Runoff Rockstar to the Excecutive Director of Alter Terra. Also in 2012, the Mexican General Consulate in San Diego awarded Romo a Remarkable Mexican-Americans Making a Difference in San Diego award for his work to conserve the Tijuana River National Estuarine Research Reserve. Other innovations led by Alter Terra include the deployment of high tech sensors to detect sediment flows, and the installation of 8 weather stations operated by canyon residents under the Coastal Storms Project funded by NOAA, the creation of the Tijuana’s municipal native plant nursery funded by California Coastal Conservancy, the deployment of radio frequency identification devices to track trash funded by the California Water Board and the city of Imperial Beach, the distribution of “Wicking Gardens among canyon families funded by UCSD Visual Arts Department, the collection of toxic soil samples funded by UCSD Super Fund Research Center, and a long list of other creative ideas implemented as projects by the Alter Terra staff. We will ensure to continue this innovative approach to serve the Water Board in its quest to implement the TRVRT strategy. Our negotiating capabilities keep improving with new tools developed by continuous practice and though our affiliation with the Earth Island Institute that provides training to its more than one hundred affiliated NGO’s. As participants in the process to create and refine the Tijuana River Valley Recovery Strategy (TRVRT), Alter Terra takes pride in proactively offering guidance, educated opinions and input in regional and international policies to establish a new collaborative style that avoids conflict and encourages public agencies, private interest and non-government organizations to work together to fulfill common goals. As a contractor to the Water Board we continue to build our skills to help implement the TRVRT strategy, specifically bringing Mexican agencies together, identifying funding opportunities and influencing the decision making process to recognize the value of implementing measures to prevent the flow of unwanted sediment, trash, waste water and pollutants into the lower Tijuana River Valley. In order to accomplish the above, Alter Terra is prepared to engage present and future decision makers and all relevant government agencies to educate them on the TRVRT strategy and its beneficial implications for their constituents. We will furnish the appropriate documents, maps, data and other materials to facilitate the adoption of agreements, participate in all US and Mexican TRVRT meetings, facilitate bi-national meetings, contribute our expertise in maintaining a healthy, respectful and fluid communication process between government entities from both countries, and when needed, obtain the support of high level decision makers from Mexico’s three levels of government. Romo has participated in innovated approaches throughout the bi-national Tijuana River Valley (TRV) that include the Eco-park in Tijuana funded by the California Coastal Conservancy and operated between COLEF and CESPT, managed by Romo for nine consecutive years. He promoted the concept and idea of decentralized water treatment in Tijuana that eventually conducted to the construction of three new plants. As an advisor to the Baja California State Assembly, he introduced a number of legislative ideas on water management, water treatment, resource conservation, and sustainable development practices. As a Chair of the BECC’s Advisory Board, he introduced the idea of adopting sustainability criteria (still in use) in the project certification process, implemented in every TRV project since 1996. Romo’s ideas and direct supervision helped creating more sustainable infrastructure. Plan, regarded as the most innovative watershed based urban plan by SEDESOL, the Mexican Social Development Agency, and the most creative by CONAGUA, the Mexican Federal Water Authority. The creation of the smallest watershed council in Mexico is another one of Romo’s contributions. The Urban Land Institute awarded Romo the Smart Growth Award for the “Los Laureles Master Plan” in 2008, the Visionary award for the “Pervious Pavers Project” in 2009, and the Best of the Decade Project Award in 2010 for the “border 2012 Park” entirely built with trash collected within the Laureles Sub-basin and re-purposed as construction material. Currently Romo and Alter Terra staff are working with the Tijuana city council to continue expanding the idea of watershed based urban planning to every one of the 23 sub-basins within Tijuana. Alter Terra’s motto “Building Partnerships for Conservation” summarizes our philosophy.